If you are an Android smartphone user then this article is for you. In the present technology, most of the modern phones provide a smooth and enjoyable experience. But, there are few most common issues that every Android users are facing with their smartphones. Do you know what? These 7 problems can be solved very easily with these solutions. Here is a guide to the 7 most common android issues and how to fix them. Let us see the list of the issues and how we can solve them. Forget about turning off WiFi and GPS. Those are old tales. The consumption of these elements can practically be ignored unless there is an app fundraising resource, which is more common than it seems. Manufacturers such as Huawei include in their Android versions a performance enhancement system that automatically alerts the user when an application that is not being actively used consumes more power than it should. It may not even be a particularly aggressive application, but a bug with unfortunate consequences. From the Android configuration menu, you can access the parameters of the battery consumption. The basic details may vary slightly depending on the device, but in all cases, it is easy to see which applications require more power and which are in use. Is consumption still too high despite having closed all non-essential applications? In that case, a restart usually solves 99% of problems. It is also possible that you are simply sucking up the battery excessively more than the use, in this case, management applications can be helpful to save Android Battery. Also, the possibility of the battery being damaged can not be ignored. With the passage of time, it is normal to end up losing capacity, which in turn will reduce the autonomy. A classic among classics, especially on low-end phones. Although a reboot usually solves most of these problems, it is always a good idea to inspect the system memory for rebel applications that may be consuming more resources than they should. If a purge of the more gluttonous applications does not work, it may be a cache problem. In that case, just go to the storage menu (accessible from the Android configuration panel) and manually clear the cache. Are there any problems? Extract the microSD drive and/or test to set the phone to use the card as little as possible. The memory of microSD cards is usually much slower than the internal storage of the phone, which can cause very important slowdowns. The reasons why a mobile phone can be overheated are varied. As a general rule, it is uncommon and only occurs when a particularly demanding app is run continuously, such as a game with colorful graphics, but sometimes there is something more serious behind it. It is possible that a resource-intensive application is running in the background or invisibly to the user. In this case, the same tips apply as to improve the excessive consumption of the battery: look for the revolts application and finish with it. Be very careful here with the camera applications, because they can turn out to be more gluttonous than it seems. A poorly designed cover is also a factor to consider. Try to use the phone without it for a while and check if there is any difference. It is also important to use quality chargers that are in a good condition. Beware of excessively cheap cables and chargers. Finally, you should not rule out the two worst options: a virus making your background or a defective battery. The first of these problems can be solved with one of the many anti-virus software available on the market (and promising not to reinstall applications of doubtful reputation from now on), while the second may involve technical service intervention. It is always a good idea to see if the manufacturer has undertaken any service campaign to correct any defects. In the case of phones with a detachable battery, it is also advisable to observe their surface for strange bumps. This common fault is usually due to a memory problem in most cases. The application receives information that it can not process, resulting in blocking the software in question. Restarting the phone or reinstalling the app usually fixes the problem, but sometimes it may be necessary to manually clear the cache. Another possibility is that the application in question has been updated to a version incompatible with the software of your phone. In that case, it may be a good decision to download the previous version from a trusted repository as APKMirror. Be very careful with distrust of unofficial sites or of little reputation apps if you do not want to end up with the smartphone become a hive of a virus. A common and rather irritating failure is the inability to access the Google PlayStore. Clearing the cache and rebooting the phone usually works, but they are not universal remedies. There are few other solutions to this issue. Google Play needs to know the date and time of the device, so it’s a good idea to check if the automatic sync of this data is turned on. Another possibility is that a failure is occurring in Google Play Services, essential for the operation of the store. In this case, you need to clear your cache and data, which are different from the store itself. If none of this worked, maybe it’s because you’re using an older version of Google Play services. Try to download them again. One last possibility is that Google applications and services are fighting each other. Google Play may require access to some official app that you have disabled, so look in the application list of the Android configuration menu and check that all of Google’s are working. Today, most of the manufacturers include address books with some sort of automatic organization to avoid duplication of contacts. Just search the menus a bit to find an option that may be called ‘group contacts’ or ‘remove duplicates’. Organizing your contacts directly from Gmail can be even more practical. To do this, just open your email account on the PC, go to the ‘contacts’ section and click on the ‘Duplicates’ section. Nothing is easier if you have to manage a particularly long list of names. Finally, there are also a handful of applications that can help you keep your contacts organized. You can always give them a try. There are so many things that can fail on a WiFi connection that it is impossible to offer a solution that is possibly one of the most recurring problems on any device with Android. Having ruled out coverage and password change issues, there is still something to do. First of all, you can not forget to restart the router. It could be the problem and not the phone, but the access point itself. If it still does not work (and the device was previously connected to that network beforehand), it is possible that the problem is that the network is incorrectly registered. In this case, you can try to delete the data from the WiFi network. Each device shows this option slight differently, but it is simple. In the WiFi menu, search for the network in question, hold your finger to bring up the options menu and press ‘delete network’ or any other equivalent option. Once removed you must refresh the list of available WiFi networks and reconnect the device by entering the connection data from scratch, but if you are lucky this will be the last time you will have to do so. These are the 7 most common problems of Android mobile devices. 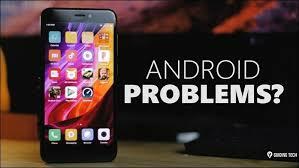 I hope this article will help you to solve all your problems on your Android devices. If you still facing any issues, let us know them through the below comment section. We will get back to you to solve all your queries as soon as possible. Would you like to add any other information to this article? Then write them to us through comment box or through our contact us page. We will review it and include in this article in the next update. What is the most common problem you are facing with your Android Smartphone?